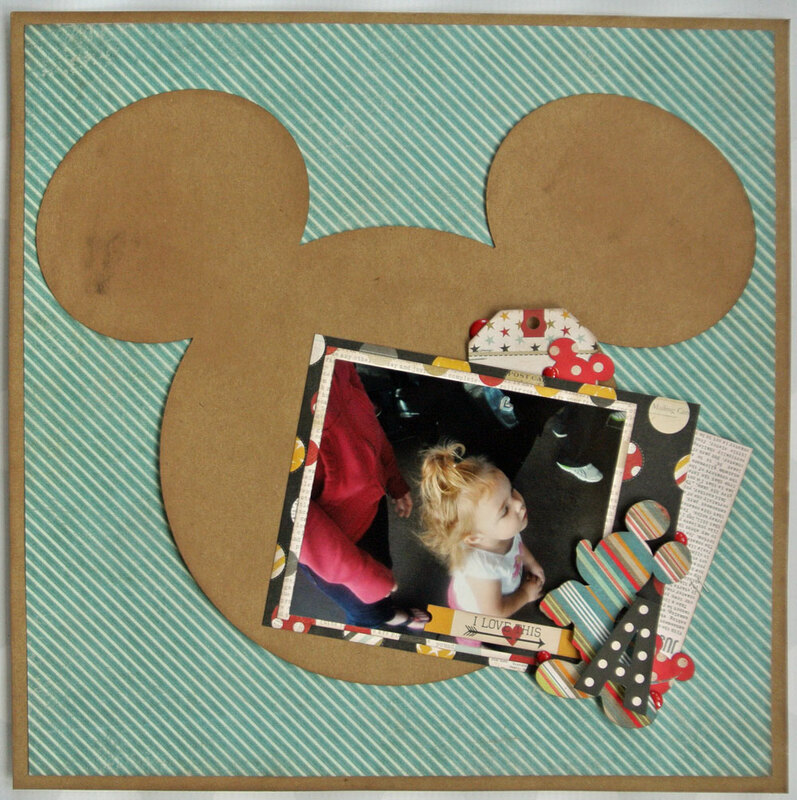 Remember way back in January, I started my 2014 Disney Album? I’m finally back with another page. 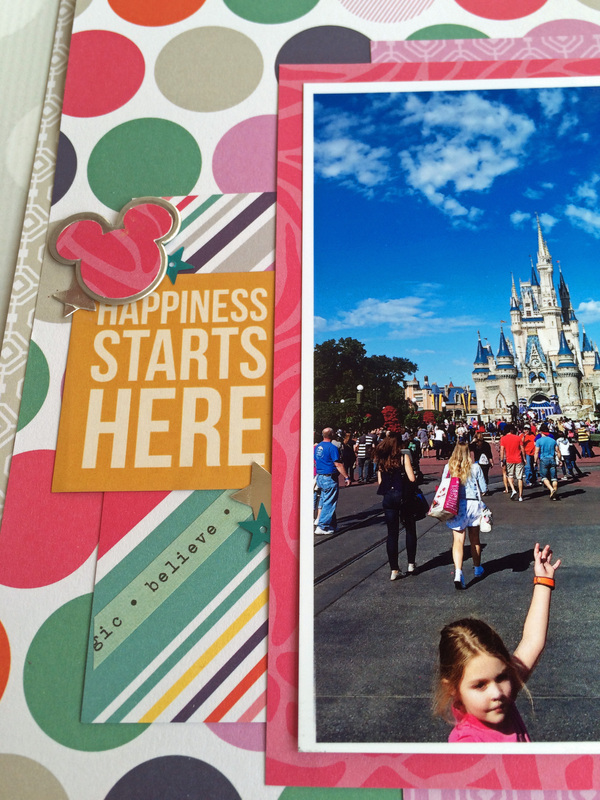 When we arrived at the Magic Kingdom it was an absolutely gorgeous day, and it was also right when the Dream Along With Mickey show started. Not only was the show entertaining, but we got the biggest kick out of Hartly. At times she was singing and dancing along and others hiding behind Travis or me. 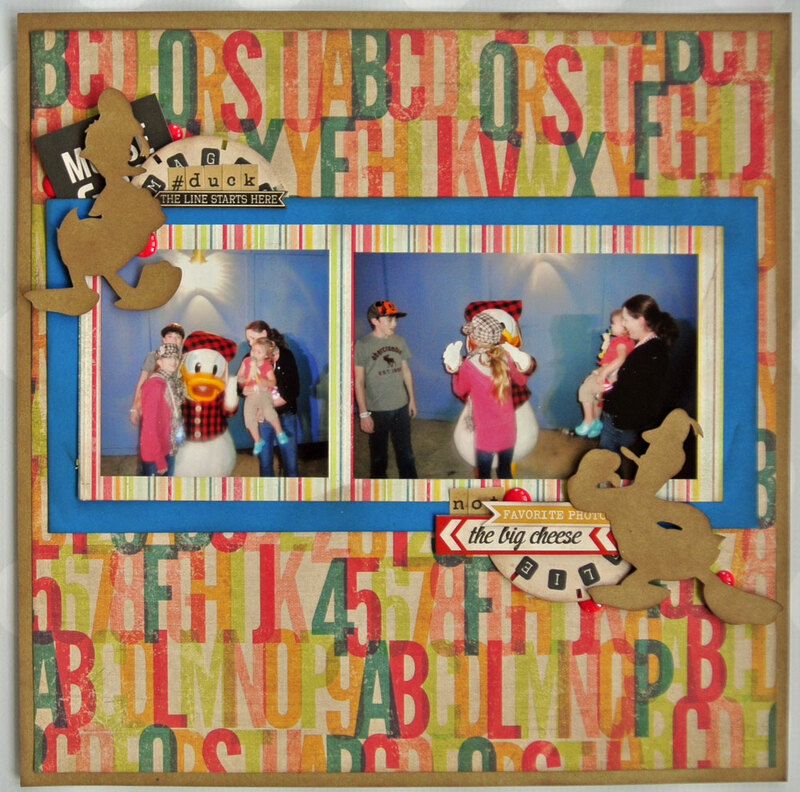 I used DCWV’s Chick Stack filled with bright, happy colors mixed with embellishments from Simple Stories Say Cheese collections. 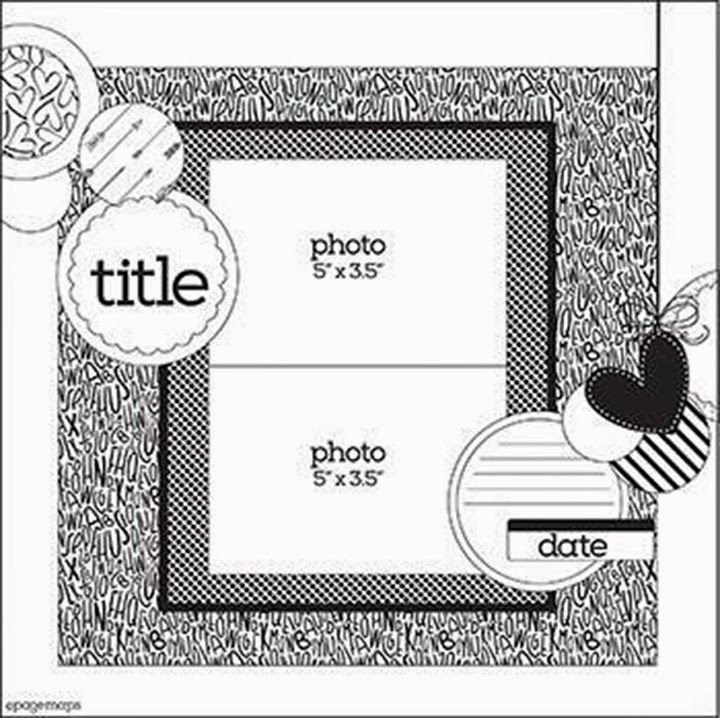 Guess who’s gotten in the habit of putting her layouts into page protectors? Luckily this girl, because silly me knocked over an entire glass of tea over on my desk. 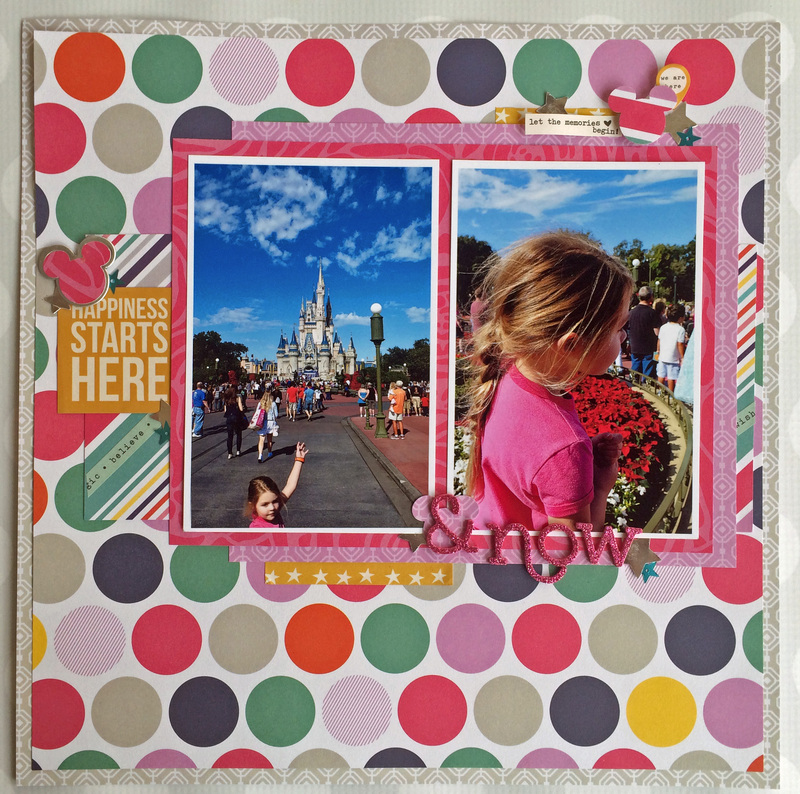 Magically not a drop got on either of my layouts. Yay! To see more of my Disney 2014 Album or other Disney albums, click here. And goodbye procrastination. He he. 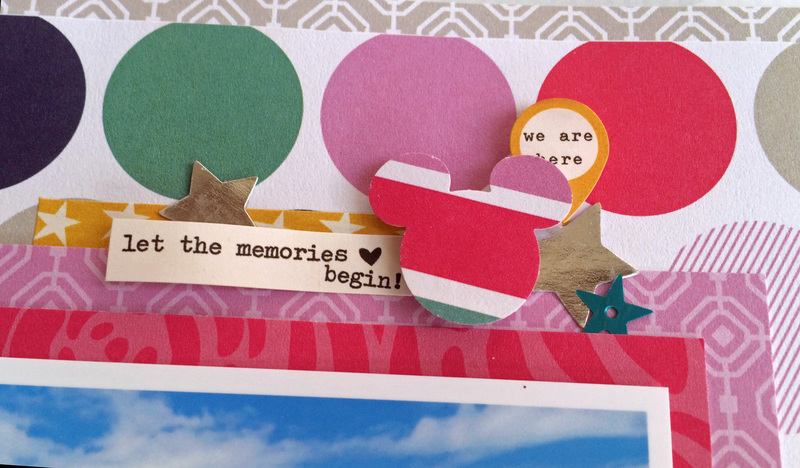 I’ve decided that starting your former Disney vacation album right after you book your next Disney vacation might not be the best way to record all those memories. 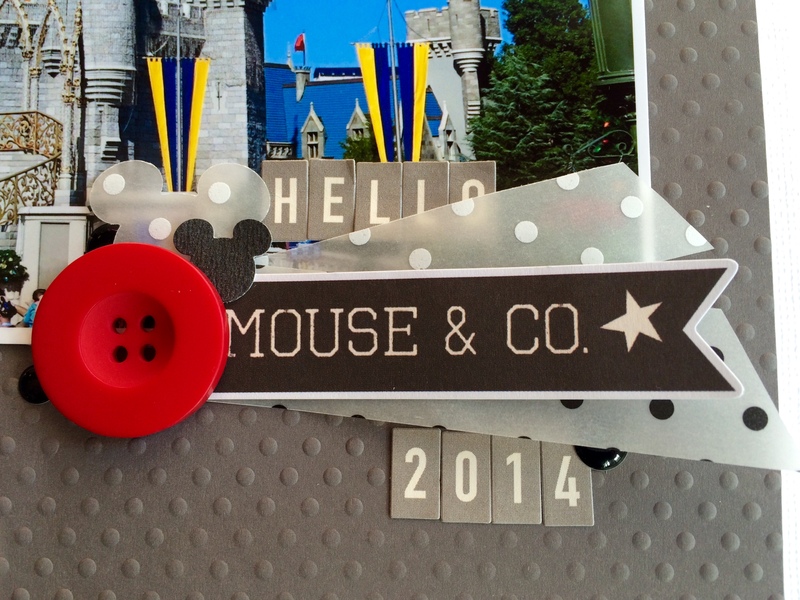 So, I am a bit excited to say that I have officially started my Disney 2014 album. 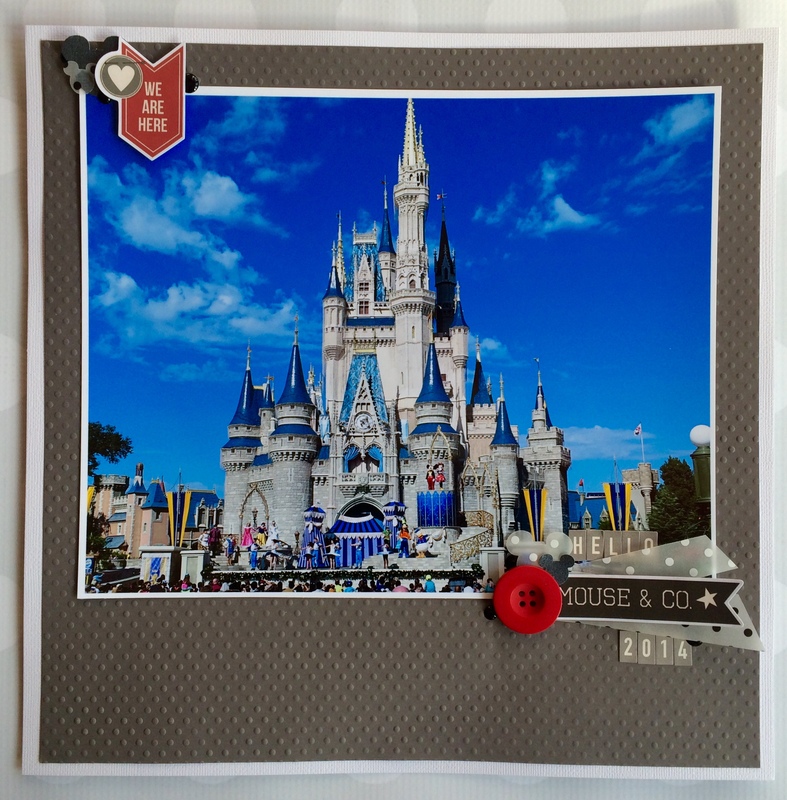 I wanted everything to compliment rather than compete with my picture of Cinderella’s Castle taken when we first entered the Magic Kingdom, so I chose a textured paper and vellum prints from the DCWV Premium Paper Collection 5 Packs. 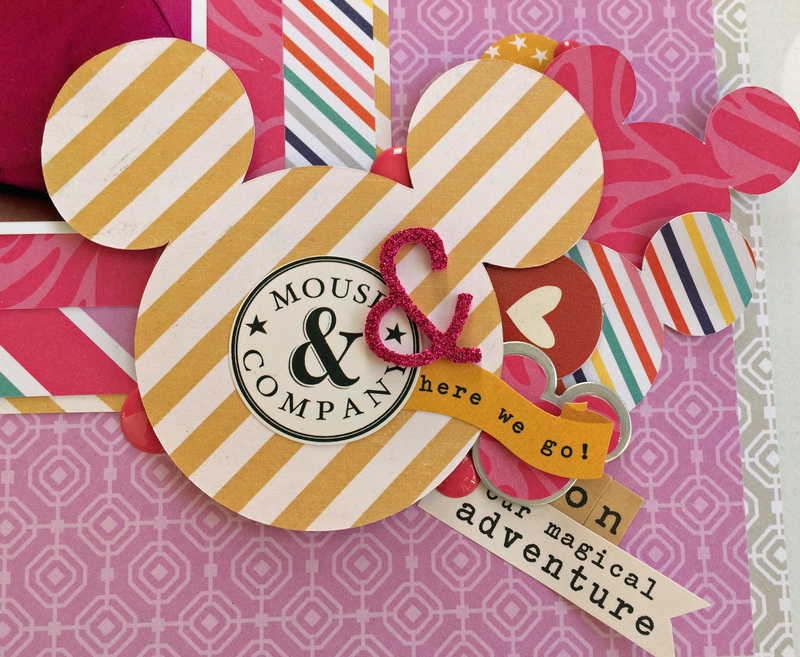 The Premium Paper Collection 5 Packs are filled with various types of specialty papers including textured, foil, vellum, burlap and laser cut papers. 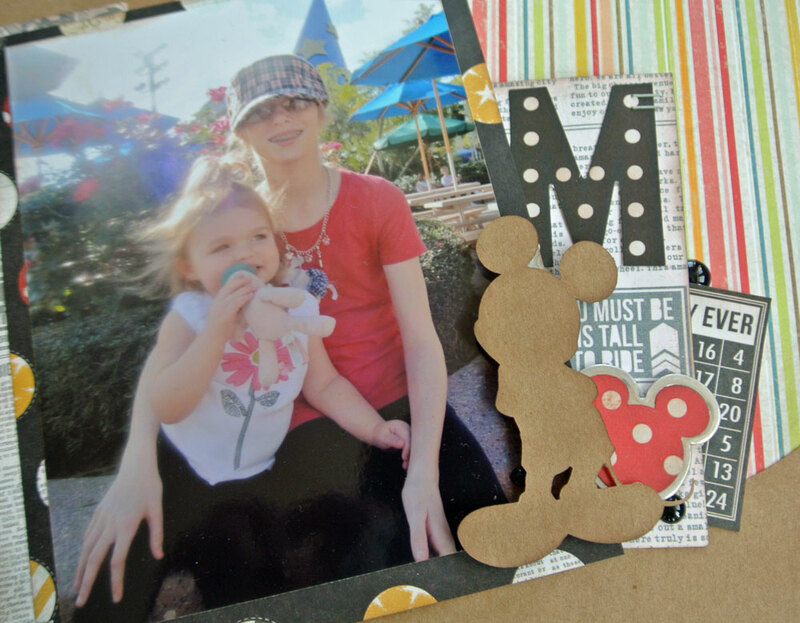 Using a Mickey punch and several papers with different textures and finishes I was easily able to make my coordinating Disney embellishments. 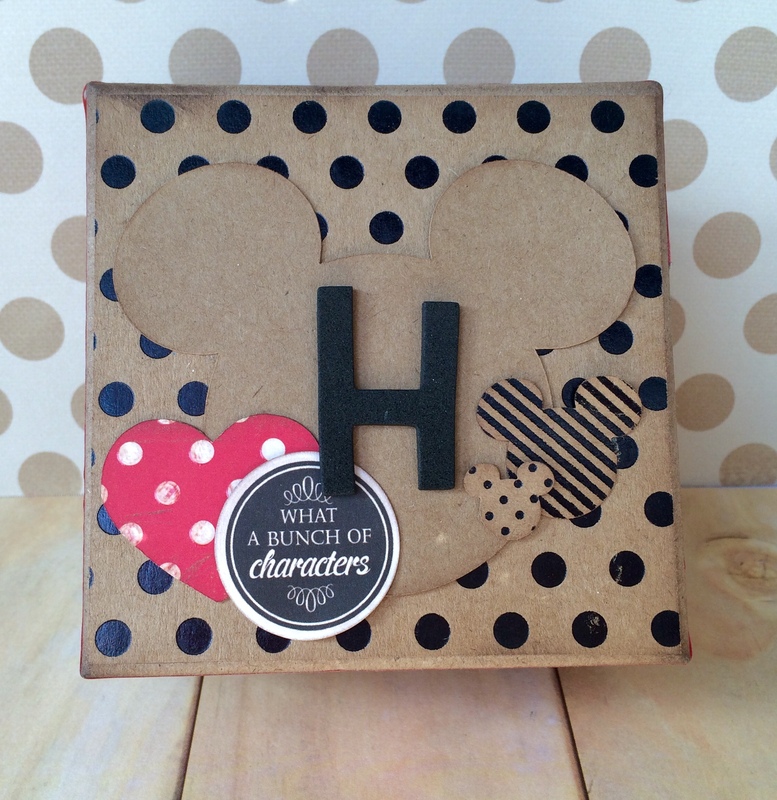 If you’ve been to Disney lately, you know that you come home with lots of little collectibles like trading pins and even now your Magic Band, so I decorated a DCWV Kraft Nesting box to house some of Hartly’s little trinkets. 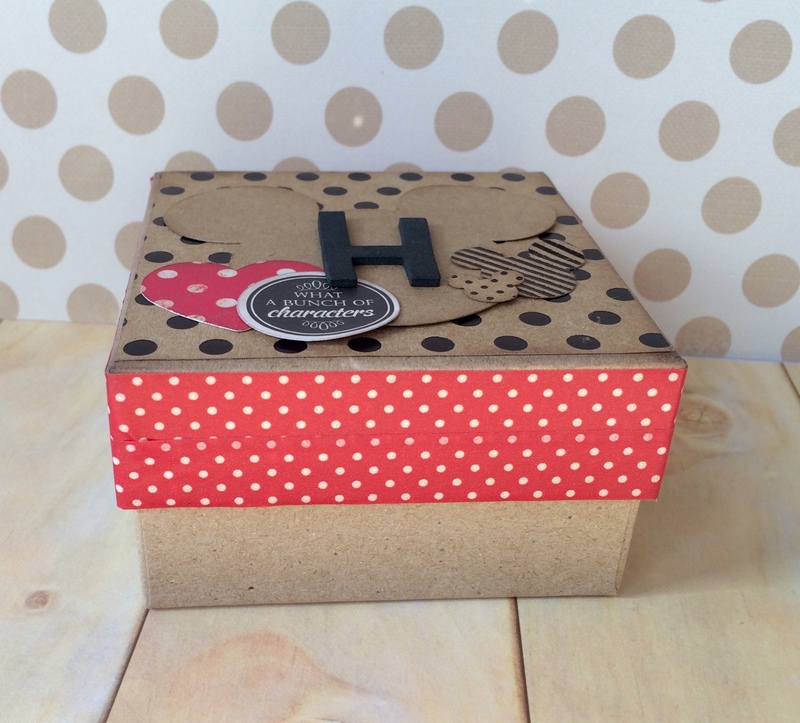 With just a few bits, pieces and some washi tape her box was ready. And since she also knows the Nesting Box set includes 11 more boxes that’s a good thing, because it looks like I’ve got more to make. 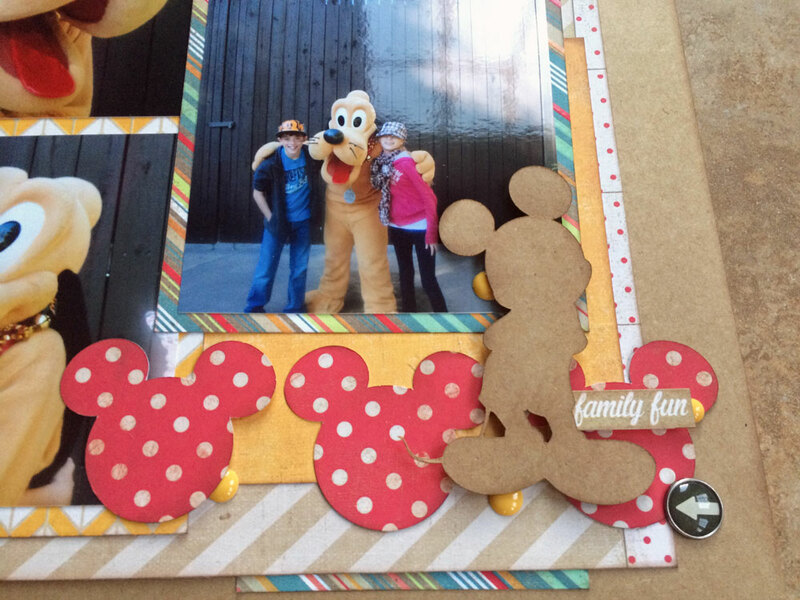 However if you’re going by these pictures, he might not be the entire family’s favorite. Hartly was a little less than thrilled to meet Donald. But, the rest of us have a spot in our hearts for the temperamental yet totally loveable duck. 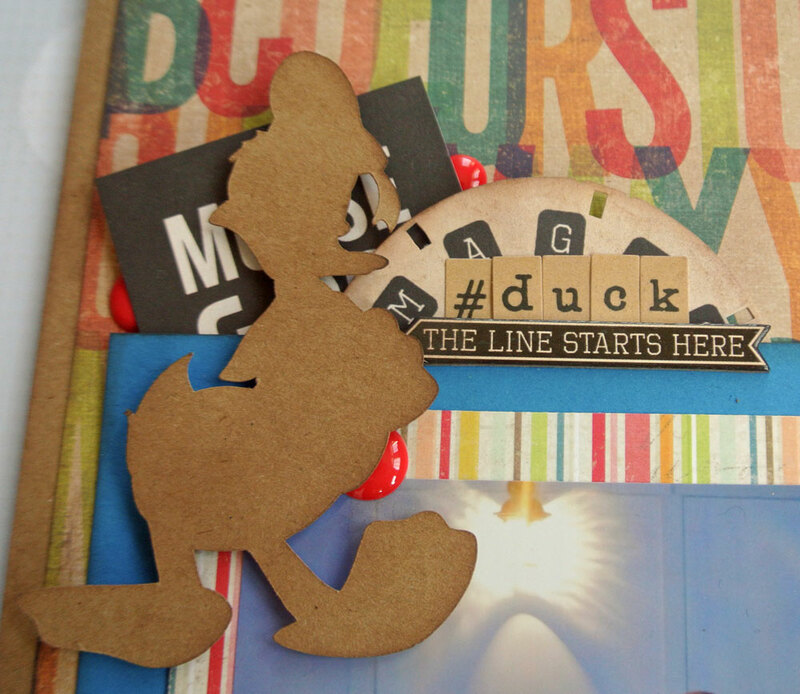 To coordinate with the Mickey images I’ve used on the other pages, I created a couple Donald silhouette images using my Cricut Explore and Mickey & Friends cartridge. Being little at Disney means that every once in a while you’ve got to sit and wait. 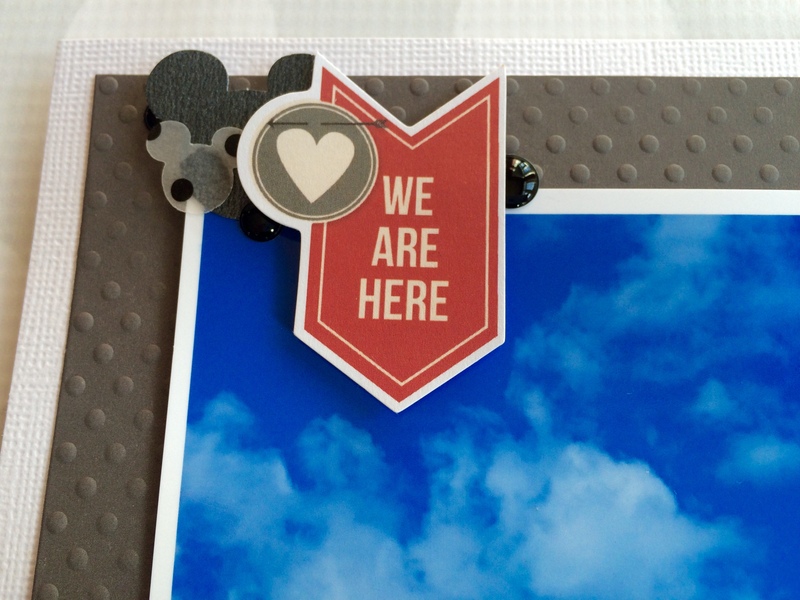 Fortunately that usually means a delicious Disney snack or maybe even a little shopping. 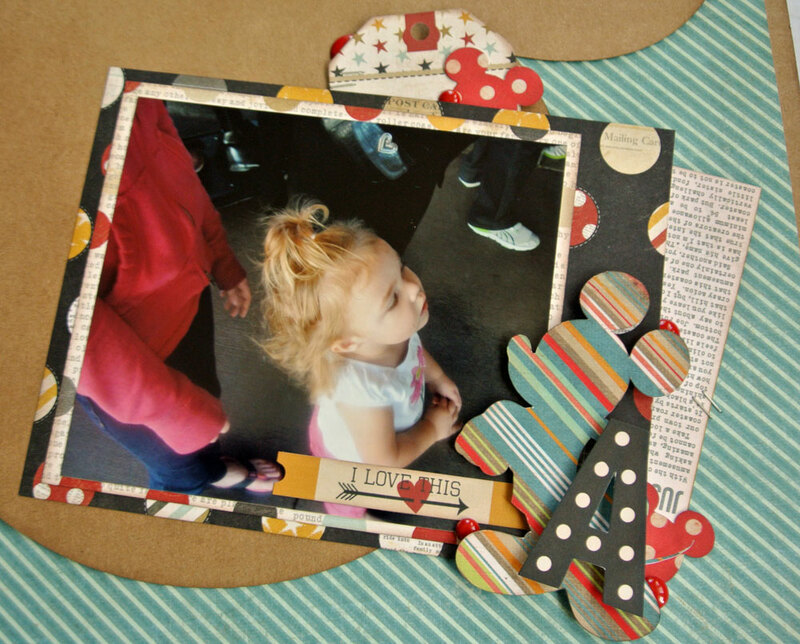 I used DCWV’s My Sunshine Stack along with various Simple Stories Say Cheese embellishments to create my little cluster surround the girls enjoying a little down time. And the other thing you do a bit of at Disney is waiting in line. I love this picture of Hartly waiting for her turn. Whatever it is we’re waiting on must be good, since it’s holding her attention. 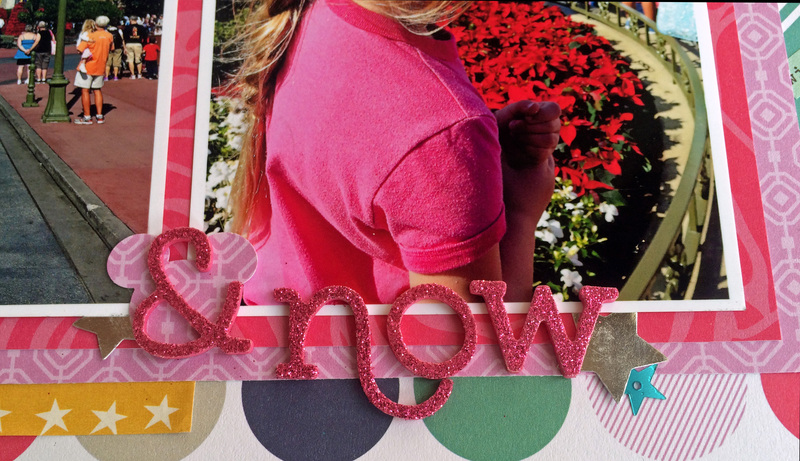 Not only did I use the cut portion from my first page as the base for this layout, I simply flipped my embellishment cluster to mirror it as well. 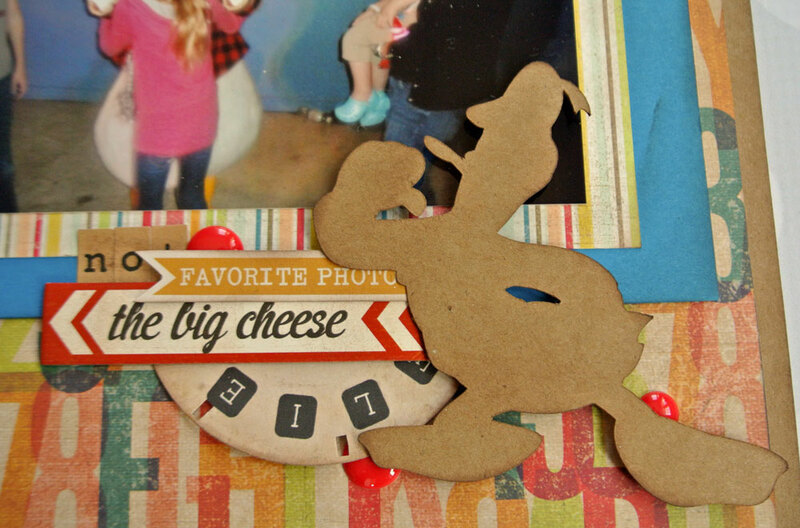 It’s Mickey Mouse’s best friend and favorite pal….Pluto! 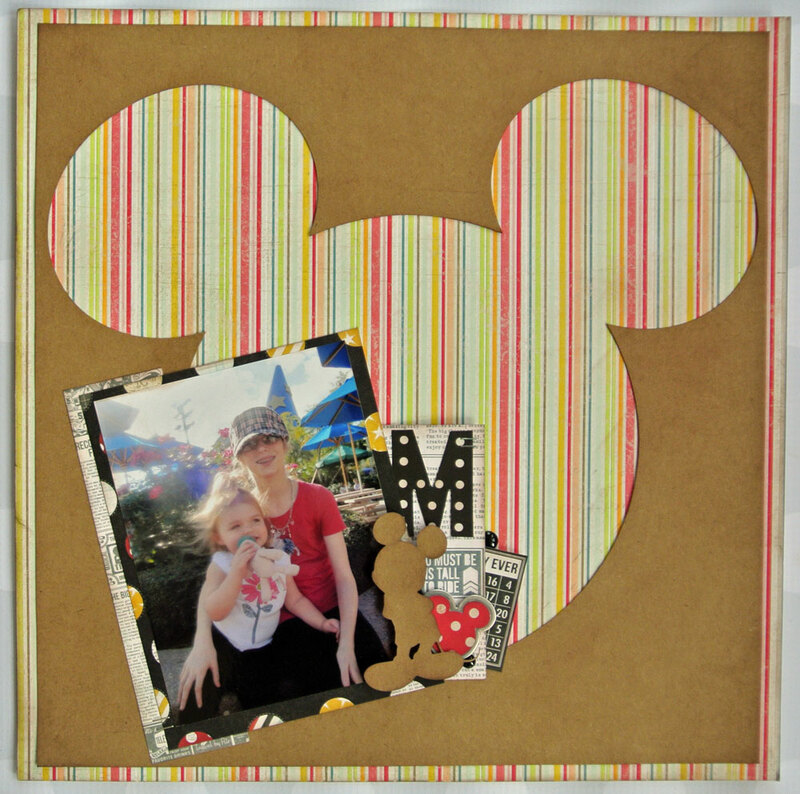 And obviously one of our favorites too. I find it hard to believe, but it’s once again a new month and time for the DCWV Stack-a-Holic Challenge. 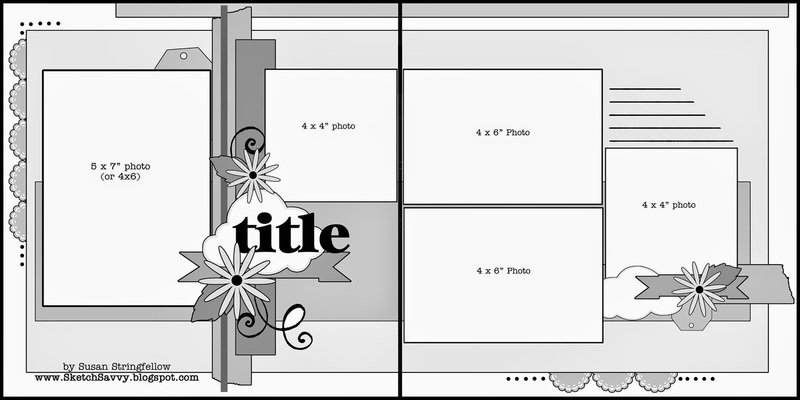 This month Design Team Member Thomisia picked out a double page layout sketch. Yikes! 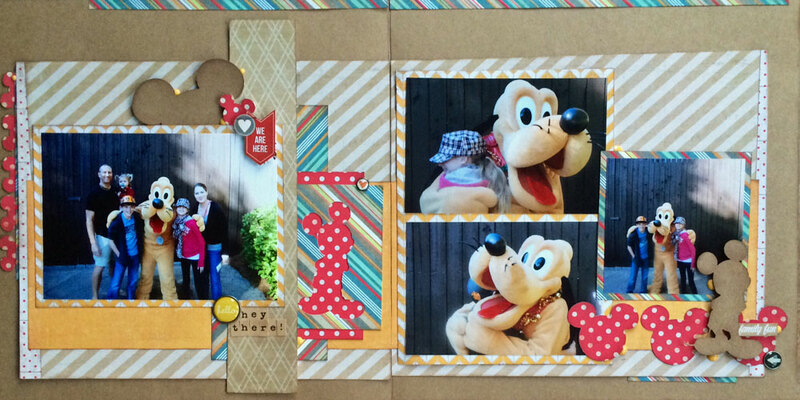 But, it just so happened to be perfect for all my puppy meeting pictures. 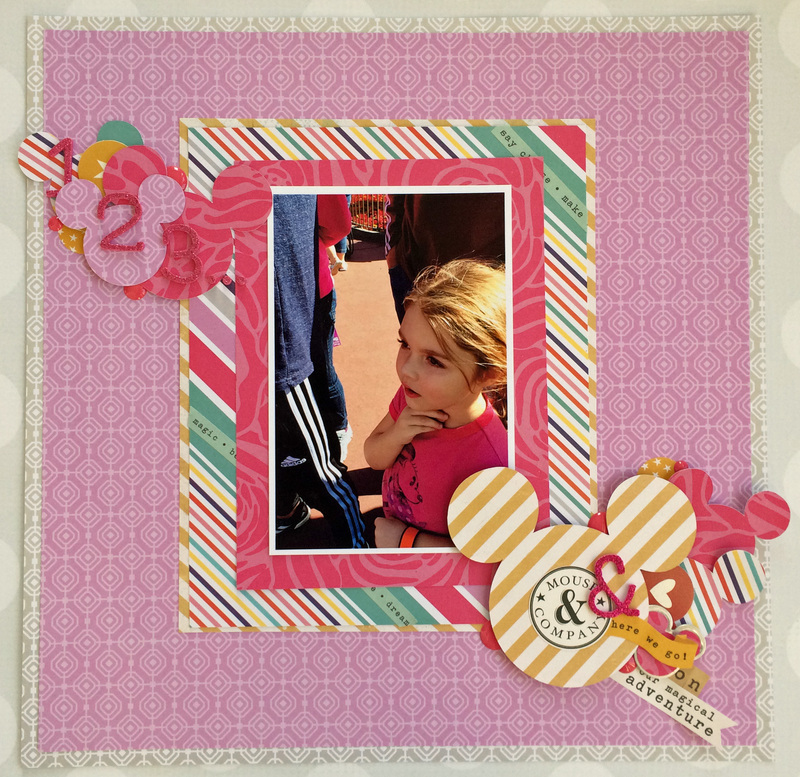 I continued to use DCWV’s My Sunshine Stack and love how well the colors coordinate with my pictures. 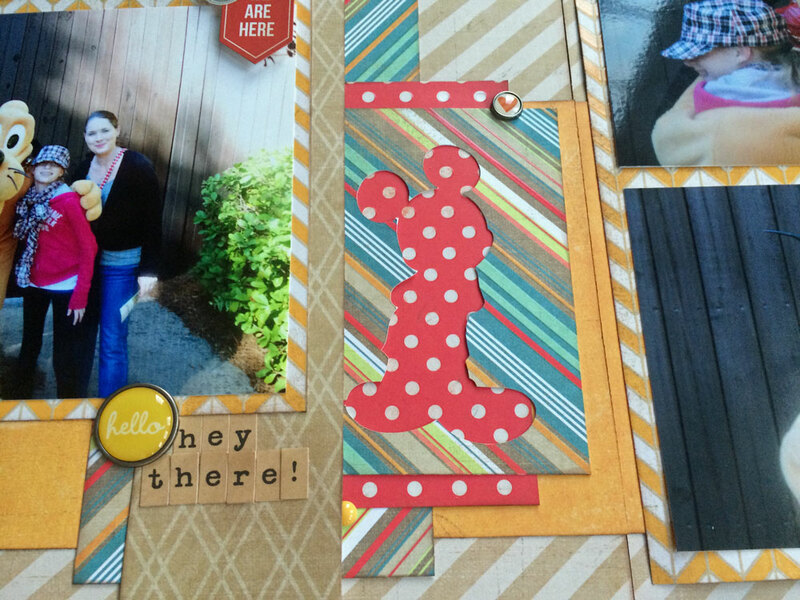 This time I added a few Mickey Silhouette cuts from the Cricut Mickey & Friends cartridge. 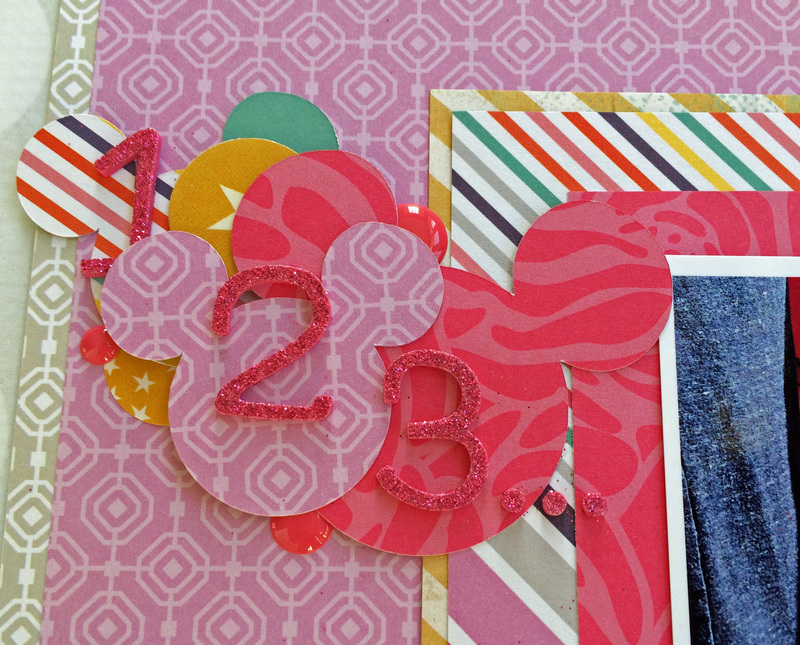 I hope you’ll join in this month’s DCWV Stack-a-Holic Challenge whether you do a double page layout, single page or card. 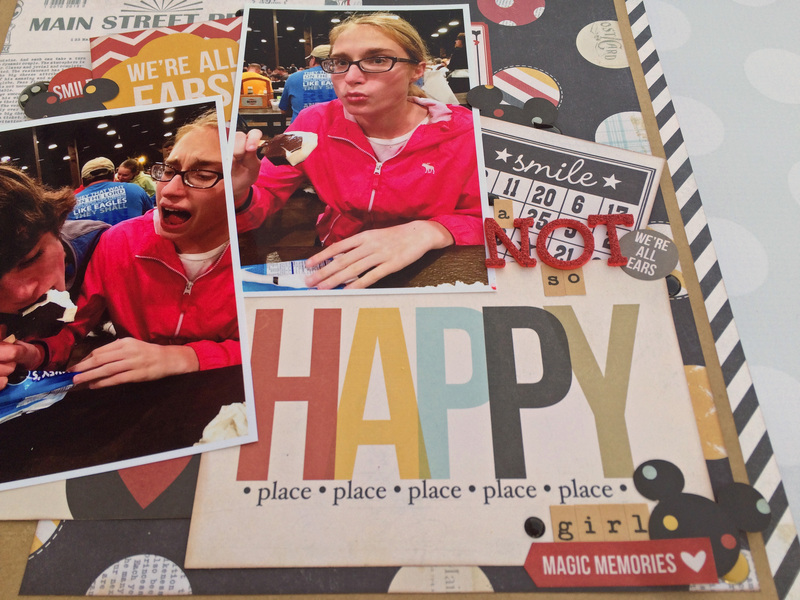 Just grab your favorite stack and get busy!